Over the years, I’ve been interviewed several times for various online and print publications about our homeschooling journey. I recently pooled together my responses from several different interviews because people kept asking for “my story” about how we homeschooled and why. I really really like the way Charlotte Mason describes method in this first paragraph. Especially the part about method implying a mental image of the end of the matter, and using the circumstances of the child’s life easily and spontaneously to reach that end. If I were a new mom just beginning this homeschooling journey with little ones and living on a limited budget, my expenses would be minimal. I’d buy Beechick’s book about the 3R’s for the backbone of my K-thru-2nd grade curriculum. 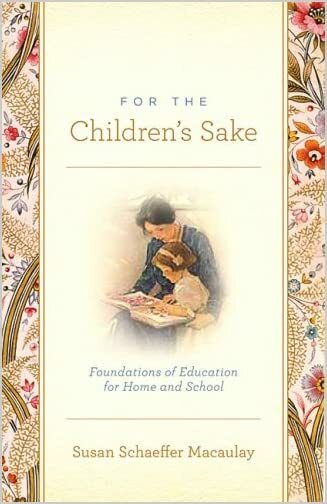 I’d read For the Children’s Sake by Susan Schaeffer Macaulay for some Charlotte Mason inspiration, and also the older book, Homeschooling for Excellence by David and Micki Colfax as a reminder about how simple homeschooling can be and how educational real life actually is when lived purposefully.